Whether you have a ducted or split air conditioning system, you want your air conditioner running in peak condition to keep you cool during summer and warm through winter. However, if your air conditioner’s filter isn’t clean, it can really slow down the cooling and heating capacity of your unit and result in other negative flow-on consequences. Your air conditioner’s filter is only as good as what it can handle. This means that if your filter is already clogged with dust, any more dust that comes through the unit is not going to be caught by the filter. It will pass through the fan and accumulate on the cooling coils, which are covered in condensation. The dust covering the coils slows down the air conditioning unit’s effectiveness and increases running costs. Even worse, some dust can wash down with the condensation and collect in the drain, blocking it with sludge. Blocked drains can be a problem for both ducted and split air conditioning systems. 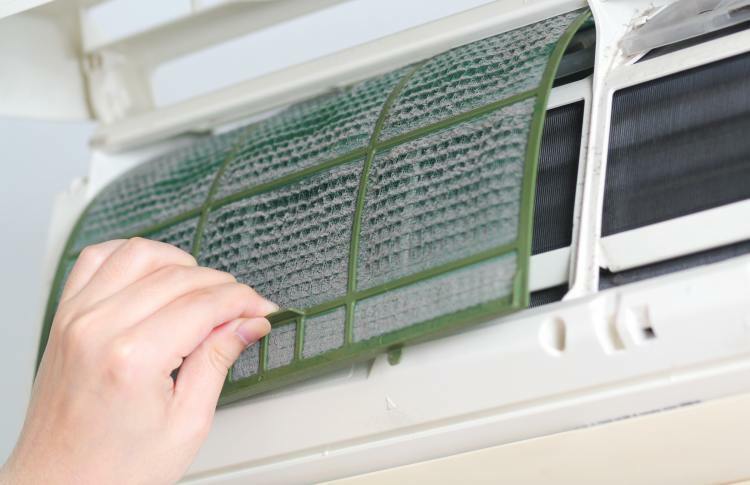 Dust which accumulates in the filter can make your air conditioning unit smelly and odourous, and attract dust mites. Extra dust that blows through an overloaded filter and is re-distributed around the room can also be irritating for allergy sufferers. If a member of your family becomes sick or has an allergy flare-up, as well as taking normal medical precautions, remember to call your Ambience Air air conditioning technician here as an overloaded filter may be contributing to the problem. When the filter is dirty, the extra dust can mark the ceiling. This is often seen when dust-filled air is blowing against the ceiling/tiles around ducted air conditioning vents, or against a lounge-room wall from a residential air conditioning split system unit. It can be easy to clean the filter, but there are other aspects that our Ambience Air team will check when they service your unit. Because many of our technicians are dual-qualified, they are able to attend to air conditioning and electrical specifications such as gas levels/pressure, the sealing of threaded fittings and testing for electrical problems. That’s why even if you do check your filter yourself, you should still make a note to get your air conditioner professionally serviced by Ambience Air – particularly before you will be using it regularly (such as the lead up to summer or winter). For residential units, air conditioner manufacturers recommend a service and check once a year.